Harmony is created out of details. 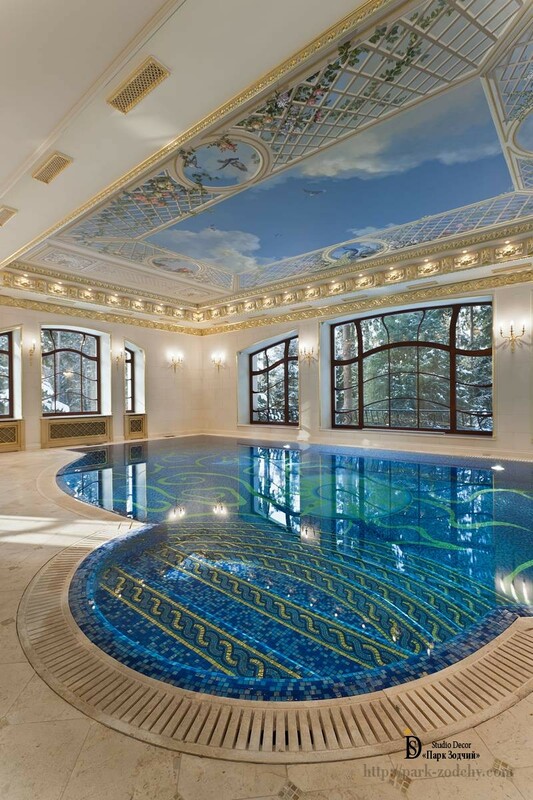 That is why, when choosing the size, shape and decoration of the swimming pool, it has been decided to abandon the common standards, but to introduce exquisite color scheme, interesting details, including painting of the ceiling and walls into the decoration instead. The history of architecture is rooted in the depths of centuries. Even so, many of the details and elements are permanently transformed, and through their use, unique interiors are created. Let us consider what has been taken from the global experience so as the pool would turn into the “pearl” for relaxation. Panel pictures on the walls. The blue mosaic has given the marine tone to water surface. And interesting gold-colored insertions imitate waves in the major part of the pool. In contrast, the steps are decorated with Greek pattern, it performs two tasks: provides security (décor defines the boundaries of steps) and makes the pool more interesting and classically festive. Painting of the ceiling visually “raises” it and it’s enjoyable, at the same time, to feast eyes on the light clouds, exotic birds, while taking water procedures. Stucco moldings, treated with water resistant undercoat and covered with gold leaf, gives palatial luxury to the room. The color scheme has been chosen perfectly: beige and blue, leaf gilding, dark, as if aged, window frames and ceramic tile floor make the room majestic. 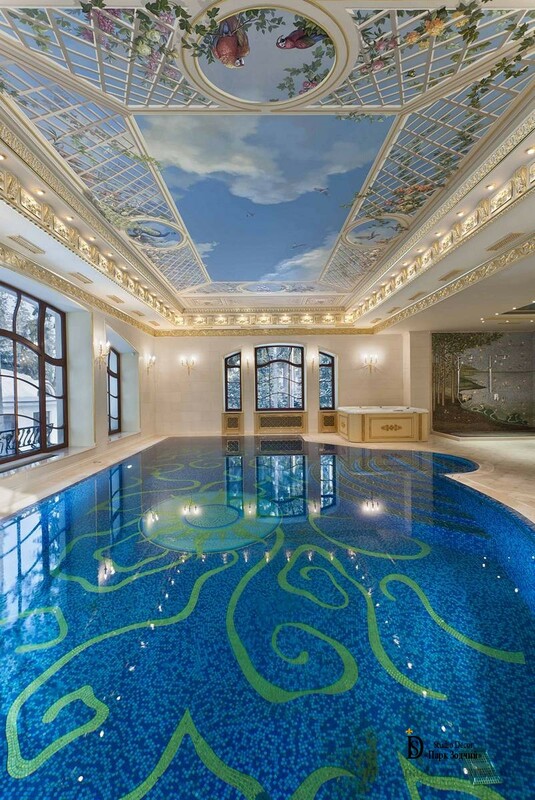 The ceiling painting of the swimming pool matches the selected style. It is made with a special waterproof paint with high light fastness. Even in the wet environment, they sustain color for 50 years. The mosaic colors of the swimming pool and the main ground color of the painting has been chosen not coincidentally. This is not only a tribute to the tradition: the blue “lagoon” of the swimming pool, the blue “sky” of the ceiling with clouds. Psychologists say that different shades of blue has calming effect on the person, facilitate relaxation and recuperation. To make so that the swimming pool would not look boring, the authors have chosen composition of strict geometric lines on the ceiling, furniture finishing and soft flexible form of the pool and window sash. Due to this, the premise has acquired a certain charm and lightness. In the pool, there are lots of windows, and it is for a reason. Daylight is reflected in the water, throws the gladsome fleck. The unusual shape of window sash gives graceful lines. Approach to artificial lighting has been somewhat different. Spotlights are located around the perimeter of the ceiling painting and create a light strip. Gilded bracket lamps are placed on the walls. 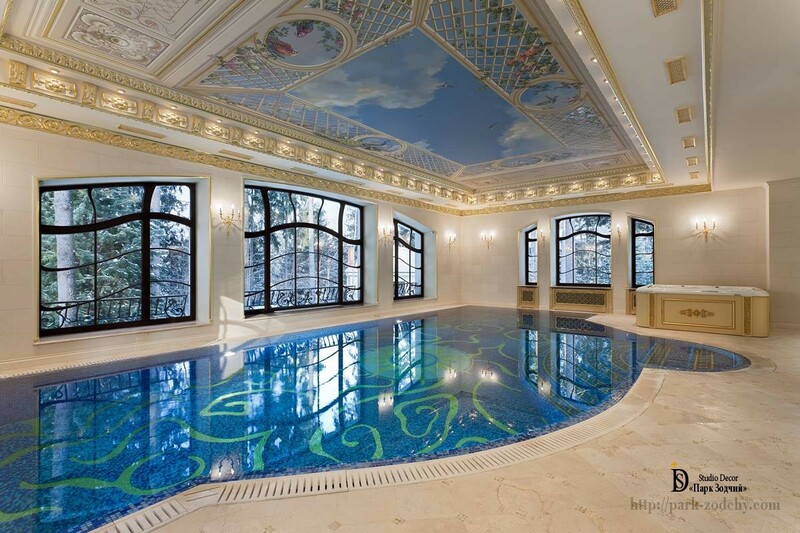 The principles of decoration (combination of different colors, choice of finishing materials, ceiling painting), which have been used to decorate the pool, including gypsum stucco moldings, can be applied in small spaces as well. The Interior of this swimming pool does not have ordinariness, but along with this, it is enjoyable to take a rest from the whirligig of life.